Complete Black Hammer Reading Order! You are here: Home / Featured / Black Hammer Reading Order! The world of Black Hammer, created by Jeff Lemire and Dean Ormston (and published by Dark Horse Comics), is my favorite addition to superhero comics of the 2010’s. Lemire and Ormston’s story takes familiar superhero mythology and tropes, and weaves them into a uniquely insular investigation of family, love, and finding happiness. Perhaps more importantly for my own interests, the superheroes of this universe go missing after fighting the cosmic threat of a Darkseid and Galactus mash-up known as Anti-God! Since the initial release of thirteen excellent comics and a Giant-Sized Annual in 2016 and 2017, Lemire has grown the world through various miniseries, ongoings, and single issues. 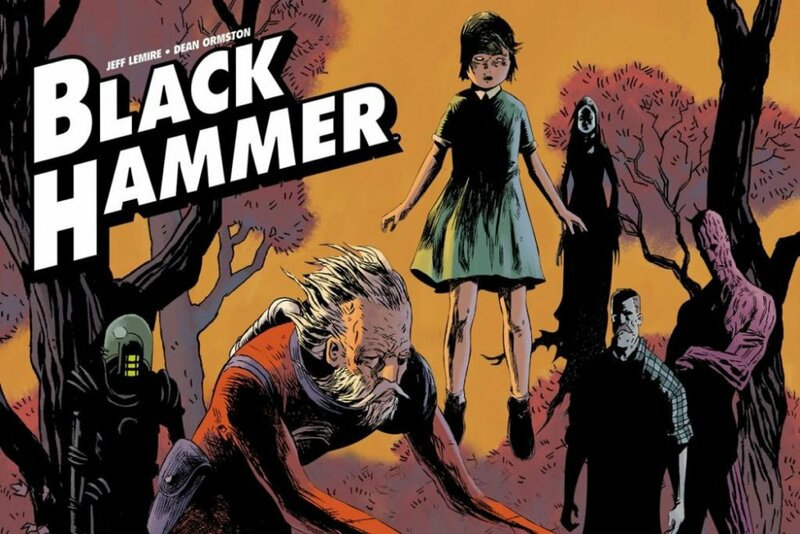 The message is clear: Black Hammer is (thankfully) here to stay! Below you’ll find a complete guide to the comics of Black Hammer, including all miniseries and one-shots as they are released. While I like to highlight personal favorites from Comic Book Herald reading orders, in the case of Black Hammer, the universe is young enough that I simply recommend giving everything a read! Black Hammer Comics in Chronological Order! Weirdly, the Dark Horse library edition is the only collected option that includes the Giant-Size Annual issue, which I’d read between Black Hammer #6 and issue #7. Also worth noting that the smaller trade paperback options pull Black Hammer #12 out of the second Black Hammer trade, and into the lead of Sherlock Frankenstein & the Legion of Evil. This is a defensible decision, but I prefer to read all fourteen issues of Black Hammer (including the annual) before progressing to the mini. Again, these issues are also included in the above larger collection. You don’t need both unless you’re just the world’s biggest Black Hammer fan, which I have to be honest, I will take issue with! As noted, Sherlock Frankenstein’s collected edition begins with the Black Hammer #12 story that details his relationship with Golden Gail. Art by the excellent David Rubin, in a very nice first take at miniseries world-building by Jeff Lemire. Although the Cthu-Louise one-shot was released towards the end of 2018 (closer in publication to the conclusion of “Age of Doom” issue #5), I recommend reading it in connection with Cthu-Lou’s presence in “Sherlock Frankenstein.” Art by Emi Lennox and colors by Dave Stewart. The issue is an interesting choice for Black Hammer universe expansion, finding a lane into teenage bullying and cruelty. There’s a universal sadness across much of Lemire’s best writing (Essex County, Underwater Welder, Sweet Tooth, etc), and Doctor Star & The Kingdom of Lost Tomorrows goes straight for the heart. It’s a short story about family and fatherhood that simultaneously expands the superhero mythology of Black Hammer’s JSA and Green Lantern analogues. I’d keep a tissue nearby. Just in case. Unsurprisingly, the FCBD short story is nothing but a primer for “Age of Doom” and “The Quantum Age” in between the conclusion of Black Hammer #13 and Black Hammer: Age of Doom #1. If you don’t already have this one, I’d say it’s really for completists only. For all intents and purposes, Black Hammer: Age of Doom #1 is the equivalent of Black Hammer #14. This is the same main story continued, simply with a new series launch. The world of Black Hammer flies into the future with this Legion of Superheroes inspired take on the Black Hammer verse. There are very specific connections that spiral out of the pages of “Age of Doom,” so I recommend completing that series before launching into this future narrative. Jeff Lemire and Matt Kindt are two of my absolute favorite comic book creators, so it’s be hard for me to feel more excited about Black Hammer ’45! 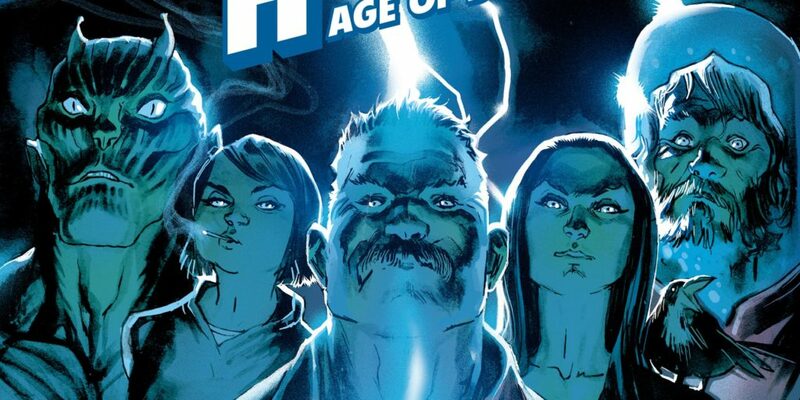 We’ve gone forward in time with “The Quantum Age,” now it’s time to dive headfirst into the Golden Age with Lemire and Kindt.